Pasta Spagettone Afeltra Di Gragnano Ai Tre Pomodore e Basilico, or Afetra Spaghetti Pasta with Three Tomatoes and Basil, is being cooked for us. Although it is made with relatively simple ingredients, any chef will tell you how difficult it is to get right. This signature dish has been exquisitely prepared, and we are enjoying it immensely. Executive Chef Riccardo Orfino hails from Padova, and was formerly a chef in Milan’s Il Luogo di Aimo Nadia, a 2-star Michelin restaurant. We are dining at Osteria Della Pace. With its relaxed and elegant atmosphere, it is one of several restaurants within Eataly. Starting with Gragnano pasta from Orfino, and making a ragu sauce with Vesuvio tomatoes from the Scafati region just south of Naples, locally sourced tomatoes from New Jersey, Primo Cutrera olive oil from Sicily, and basil, it is served fresh and warm. The new Eataly opened August 11th, at Tower 4 of the World Trade Center. 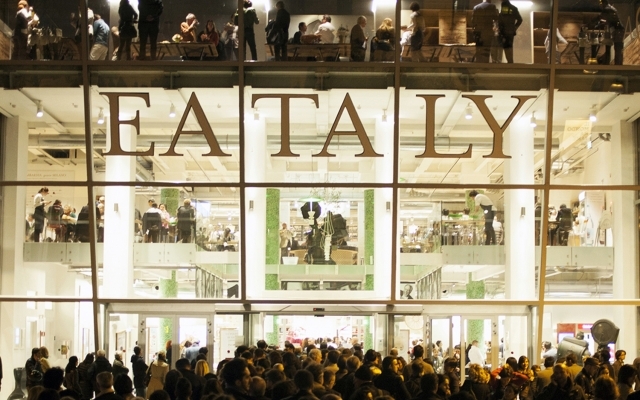 A high-end market where you can eat, shop, and learn, Eataly has over 30 stores around the world. There is quite a bit of construction going on outside the building, (this is New York, after all) but once you are inside, all the noise fades and you can start to enjoy the beautiful indoor space. Careful attention is given to every last detail in the market, and the results are amazing. With sumptuous lighting, marble countertops, bright white shelving and Italian tiles, glass panes and dark wood flooring, the store is quite appealing. You are immediately drawn in, and the lively atmosphere beckons. Upon entering, there is a huge table set with different breads from around the world, along with a brief description of each. A huge map of the world on the adjacent wall with Italy at its center, highlights each country’s staple bread. Each Eataly has a theme, and the Wall Street location is dedicated to bread, a staple that unites people across the globe. Stop for a quick, delicious coffee at Caffe Lavazza, or have a glass of wine at L’Espresso/Il Vino. Try a piadina, which are flatbreads made with meat, cheese, fruit and other ingredients - made by Fratelli Maioli. Enjoy regional Italian food at La Gastronomia. Partnering with chefs Mario Batali, and Lidia and Joe Bastianich, they have prepared dishes ready to go. Take home some delicious lasagna or eggplant parmesan. Don’t forget to stop at La Pasticceria, Luca Montersino’s specialty Northern Italian shop that highlights pasticcini, beautiful bite-sized pastries. Free cooking classes at Foodiversita are offered daily, and today they were making ravioli filled with ricotta cheese and spinach. The pasta is made from scratch. Participants in the class put the dough through a pasta machine, are then shown how to place the cheese onto the pasta, and pinch the dough to make the final product. One hundred and fifty different extra-virgin olive oils from various regions of Italy are available. There are light olive oils from the north of Italy, which are great for fish and salads. The ROI oil from Liguria is superb. The hearty, earthy olive oils from Sicily and other regions in the south are recommended for meat. The Primo Cucer from Sicily is wonderful, and could become your staple oil. Mozzarella is made fresh at La Mozzarella counter where samples are served with extra-virgin olive oil. ( Simply delectable). The Parmiggiano Reggiano has been aged for 24 months, and it is addictive. Focaccia is baked daily at the bread counter, with your choice of sweet or savory. There is Pizza Alla Pala, using fresh, seasonal ingredients, which can be enjoyed while shopping. 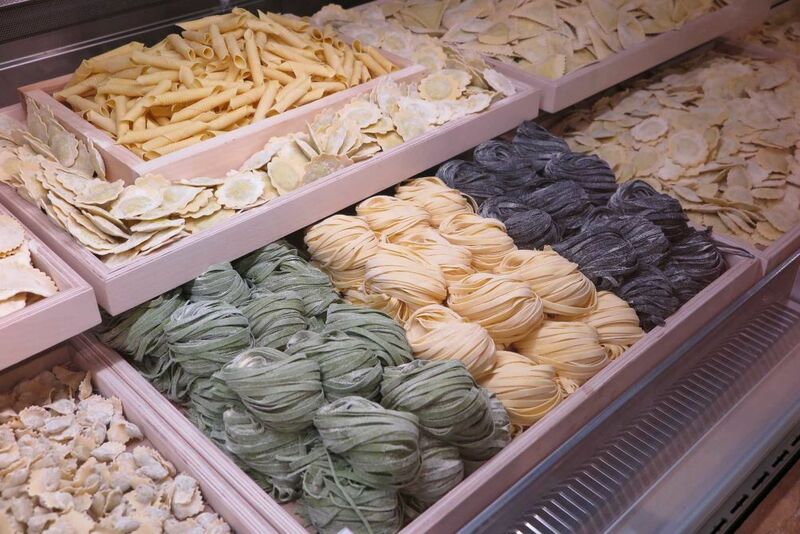 The pasta station has an incredible selection, one more delectable than the next. I had the Pasta Vesuvio alla Norma – Pasta with eggplant, tomato, and house-made mozzarella; and Agnolotti del Plin, a pasta with a light butter sauce. (It was hard deciding which pasta I enjoyed most). The fish is sustainably sourced. There is grass-fed beef, imported salumi and other high-quality meats from Levoni, a company founded in Mantua; formaggi (cheese), and coffee, and incredible dolci (sweets). There is chocolate from Il Cioccolato Venchi, artisanal chocolates made in Piemonte since 1878; a whole counter dedicated to olive oil; wonderful sauces and condiments, and of course, pasta. There are carefully selected fruits and vegetables, as well as Italian-themed housewares and T-shirts available for purchase. Stop by Eataly for breakfast, lunch, or dinner, and come with an appetite. With so many delectable things to choose from you can bring home something for yourself, your family, and your friends. Buon Appetito !